Newcomer Family Obituaries - Terry Robert Stull 1956 - 2019 - Newcomer Cremations, Funerals & Receptions. Gillie Senior Center, 2100 Morse Road. Terry Stull, 62, of Columbus, passed away Sunday, February 3, from pancreatic cancer. Terry was born August 31, 1956 to Robert and Sharlene (Marshall) Stull. Terry worked in the bakery at Giant Eagle and Market District, but his real passion was as a fiber artist, enjoying knitting, crocheting, weaving and quilting. He took great joy in giving his handmade gifts to friends and donating other works for charity fundraising. He always submitted multiple entries to the Ohio State Fair every year. 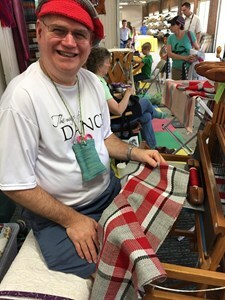 He also demonstrated weaving with the Central Ohio Weavers Guild at the fair for over twenty years. He was active at the Gillie Senior Center, particularly in their line dancing classes and performances. He enjoyed both cooking and baking. Terry will be deeply missed by Ron Clason, his partner for over 18 years, his father, Robert Stull, his brothers, Craig and Scott Stull, and his many friends. Terry was preceded in death by his mother, Sharlene Stull, and his brother, Tim Stull. A Celebration of Life will be held Saturday, February 9, 2:00 p.m. at the Gillie Senior Center, 2100 Morse Road. In lieu of flowers, memorial contributions may be made to the Pancreatic Cancer Action Network, https://www.pancan.org. Add your memories to the guest book of Terry Stull. We loved Terry and I am happy to see he is at peace. I met Terry during the Ohio State Fair several years ago. He sat at a loom with vibrant color threads, his hands neatly skillful and quick in movement when the warp went across the loom. He chose vibrant colors for all of his projects; quilts, crochet, knitting, felting and sewing. He possessed an aura of effervescent joy, and kindness. I was lured into his world because of this. Terry added color to the lives of so many people he knew, and I can say, even those he did not know. When ever I see vibrant colors, I know he made them. My condolences to Ron and Terry's family. Terry had a heart of gold and lived making gifts for all of his friends. I will treasure the ones he made for me. Terry was the heart and some of our Tuesday afternoon line dancing class. I never met Terry but Ron told me about the types of great handicrafts Terry could make. I was fascinated by Terry’s spirit of actively participating in the contest of each year’s Ohio State Fair so I went there in August 2018 and was fortunate to see the exhibition of his art in person. I am truly sorry to hear about the passing of Terry. May my thoughts and condolences bring Ron and both families comfort and ease the pain of this loss. I was the bakery manager at Busch Boulevard store when I met Terry. He was truly one of the kindest people I had ever met. We used to practice his line dancing at work and traded quilting tips. He was one of the best employees and hardest workers I ever had. Heaven has truly gained a beautiful angel. I feel lucky to have known him. Prayers to you, Ron, and both of your families as you go through this difficult time. Almost every conversation with Ron had at least a mention of Terry. Ron was so proud of him and his art. Oh, Ron, I am so sorry. Terry must have been a very special person. Although I never met him, I could tell by his impact on my long-time colleague, Ron, that Terry was family and was deeply loved and cared for! You have my prayers for your peace. He was an amazing free spirit. Who always had a smile. He will be greatly missed. Oh how much Terry will be missed! I had the pleasure of knitting with him and his help with crocheting was appreciated. Terry always seemed to have a smile and beautiful attitude. I did buy one of his woven scarves, it shall be treasured.